THE DIAGNOSTIC VALUE OF PAIN: E. B. French, B.A., M.B., Ch.B. , M.R.C.P.Lond., F.R.C.P .E. AETIOLOGY OF HYPERTENSION: G. W. K. Donaldson, B.Sc. 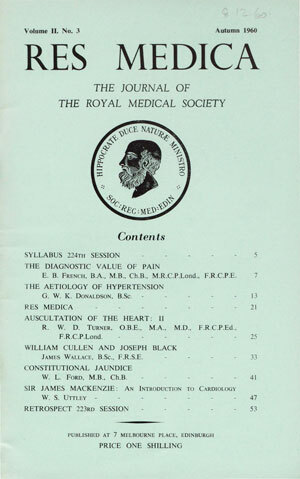 AUSCULTATION OF THE HEART: II: R. W. D. Turner, O.B.E., M.A., M.D., F.R.C.P.Ed., F.R.C.P.Lond . WILLIAM CULLEN AND JOSEPH BLACK: James Wallace, B.Sc., F.R.S.E. CONSTITUTIONAL JAUNDICE: W. L. Ford, M.B., Ch.B.